Back to the task at hand, I recently got sent the most beautiful lingerie set I just had to share with you, from the lovely ladies at Little Women. They have such a gorgeous selection of bra's, knickers and lingerie sets specifically aimed at us girls in the smaller-boobed department. I love the whole brand ethos too, they originally launched back in the 90's when the media had adopted the "bigger is better" mentality and they started creating and sourcing beautiful pieces for women with AAA-B cups! Everything on LittleWomen.com is exclusive to their site too, even the branded items have been designed exclusively for them,which I think is really cool. The bralette retails for £19.99 and the briefs for £9.99 which I think is really reasonable for such a gorgeous set, and the majority of pieces on the site are around the same price mark which is brilliant! I also wanted to mention how cute the packaging was. 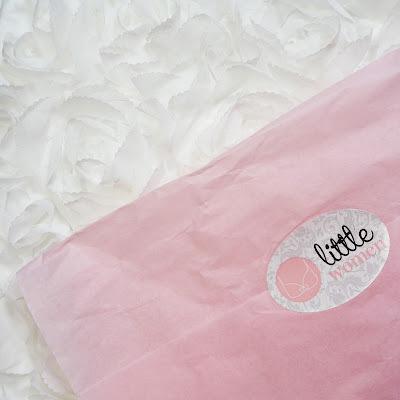 My lingerie arrived in a slim little cardboard box, (to avoid the set getting damaged I assume) which contained this pink tissue-wrapped prezzie, sealed with the little women logo. As you can see from the above photo, I managed to contain my excitement long enough to take a photo before ripping it open! Please do let me know if you check out Little Women, they're such a fab company and they have so many beautiful pieces! What a stunning piece. I'm very much a "mix-match" type of girl with very few matching sets but this has made me so tempted to go have a cheeky splurge! And what a reasonable price too.